If Elvis were alive, he might ride the monorail to a Seattle hockey game in 2020 — if they build a nicer Westlake Station. Like many visitors, the arena developers at Oak View Group were taken with Seattle’s historic monorail, where they glimpsed “a great, unused opportunity” to help future hockey fans get home after the game. OVG’s new draft environmental-impact study forecasts a meager 697 fans, or between 3 and 4 percent of the crowd, would depart by monorail from a rebuilt KeyArena at Seattle Center in 2020. Monorail supporters aren’t satisfied with such a low goal. 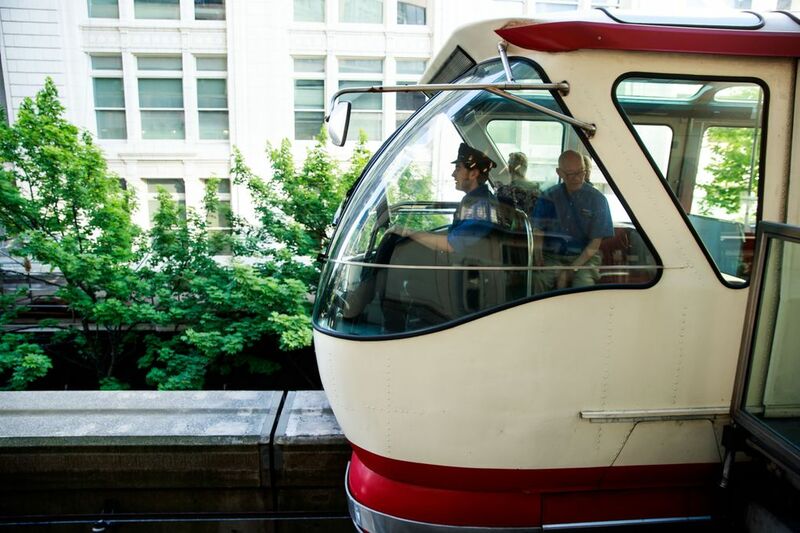 City-owned Seattle Center hired Alan Hart — acclaimed architect of the Vancouver, B.C., SkyTrain Millennium Line that carries 160,000 daily riders — to show how to improve the 1-mile monorail’s performance, by moving people and trains faster through its Seattle Center and Westlake Center stations. Hart’s company, VIA Architecture, designed a roomier passenger-waiting zone at Westlake that would make all eight train doors easy to reach from the existing platform, above Fifth Avenue. Quick people-loading might double the train frequency, so a 250-person load arrives on each of two tracks every five minutes. That’s 6,000 people an hour. 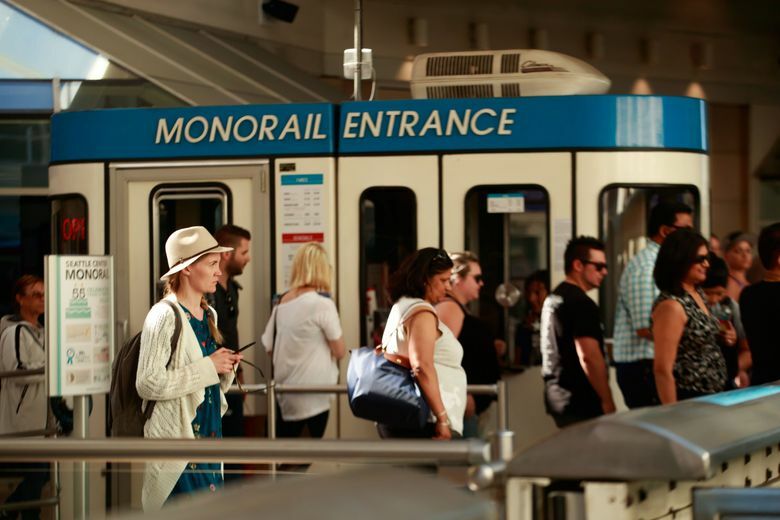 “The monorail has the capacity of at least carrying 25 percent of the people at an event away from the event, within an hour,” said General Manager Megan Ching, of private operator Seattle Monorail Services. In real life, transit flows can easily break down. Train drivers must make the trip to Westlake in 90 seconds and hope nobody has a medical problem, argues with staff, or leaves a backpack on the seats. They would release everyone and depart in 60 seconds back to Seattle Center. Perfect synchronization is the only way to overcome the monorail’s wishbone track shape, that allows only one train at a time to occupy the Westlake stop. The concrete guideways were realigned in 1988, to fit into the mall’s upper floor. Trains wedged there in a 2005 crash, and automatic stop systems were installed afterward to prevent a repeat. Ultimately, the monorail won’t lure thousands of people out of general traffic unless fans can continue from Westlake to their hotels, apartments, transit or suburban homes more easily than driving. 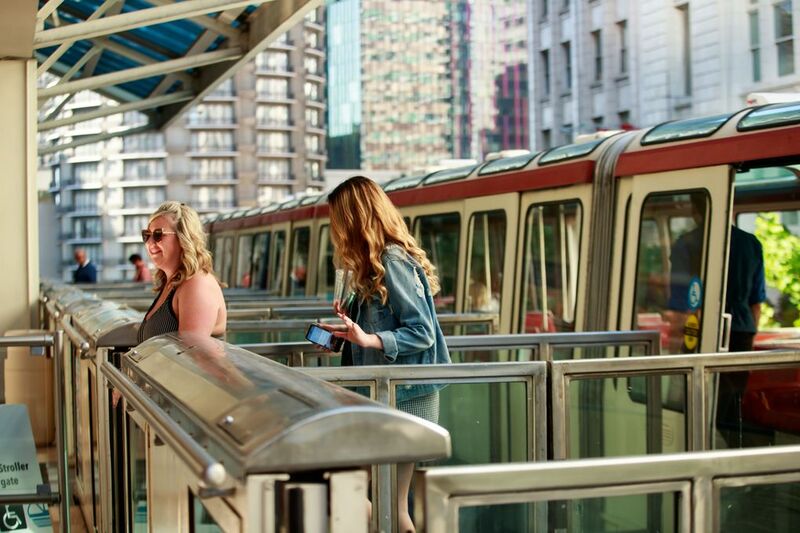 VIA’s first phase, aimed at 2020, would remove a capsule-shaped ticket booth at Westlake and a vacant pretzel shop, creating more room for people to circulate. 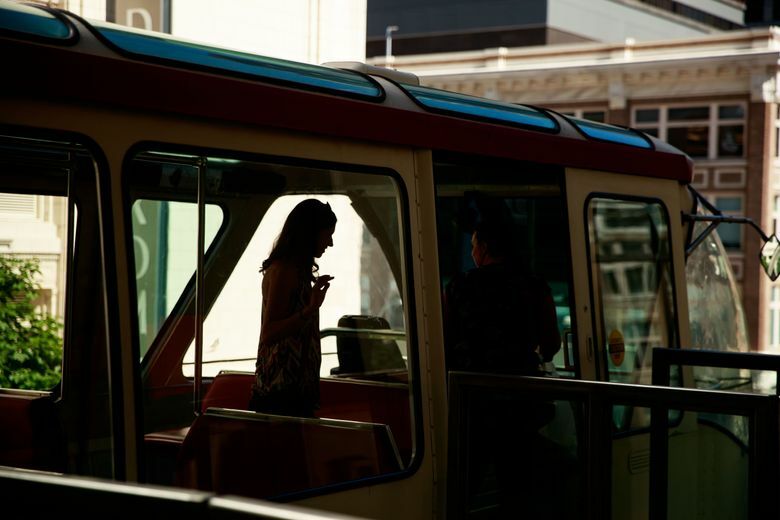 Riders would buy tickets beforehand inside the adjoining mall, tap ORCA fare cards, or wave their event tickets past laser scanners to claim a free ride. 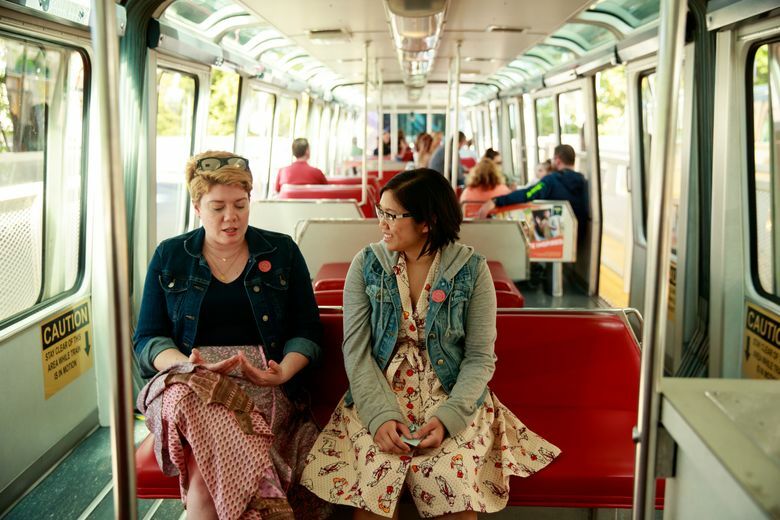 The Seattle Center stop would also be upgraded to allow faster fare payment. After the game, crowds departing the monorail at Westlake would step onto the mall’s escalators to descend, in addition to using the existing Fifth Avenue staircase that tourists currently struggle to find. The second phase would be aimed at 2024. That’s when new light-rail lines to Lynnwood, Federal Way and Redmond would bring more fans to Westlake Station, where they can finish the last mile to Seattle Center by monorail. A covered causeway, stairs and elevators would wrap around the mall’s southeast corner, leading directly to the plaza park and underground Westlake Station trains. That would require millions of dollars, and a deal with mall owners to surrender some retail space. The first phase is nearly shovel-ready, and it carries low financial risk, Hart said. If ridership grows in 2020, that would prove the city ought to expand monorail entryways in 2024, he said. Preliminary cost estimates are expected in June. By 2035, the Sound Transit 3 plan is supposed to bring light rail directly to Seattle Center. But that is merely a goal. Moreover, transit executives are already hearing community requests for tunnels, stations, route changes and even tax hikes that could push out the ST3 timeline. 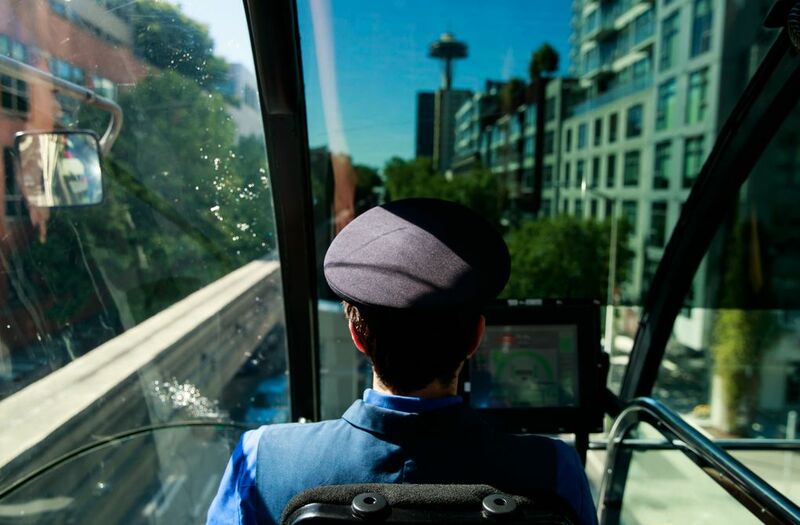 To wait for ST3 creates an 11- to 15-year period of frustration for fans, unless better transit and car infrastructure leads to Seattle Center during the 2020s. OVG proposes contributing $1 million a year toward transportation aid, for 40 years. None is earmarked for the monorail, though that’s an option. Other needs will compete for cash, such as increased taxi and car-passenger zones, a proposed underground parking structure, and walk-only streets or alleys. Beyond that $40 million pledge, OVG might be required to contribute more through Seattle’s permitting process. Other possibilities include federal transit grants or city bonds, which were used in 2008-2009 to fund $4.5 million in retrofits of both the blue and red trains. OVG hasn’t responded yet to requests for comment, nor has Chicago-based mall owner General Growth Properties. 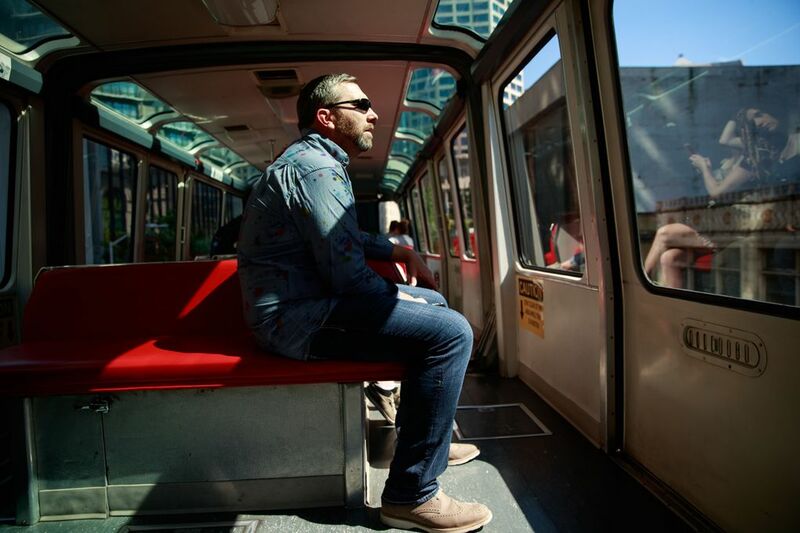 Hart expresses a special love for the 1962-vintage monorail. “In many ways it was the inspiration for us, as designers, for the SkyTrain system,” he said. Hart later worked in 2003-04 on designs for the unbuilt Green Line monorail proposed from Ballard to West Seattle. VIA’s station analysis, to be completed for less than a $350,000 city estimate, is to be reimbursed to Seattle Center by the Federal Transit Administration, said center spokeswoman Deborah Daoust. Arena groundbreaking is aimed for this fall.